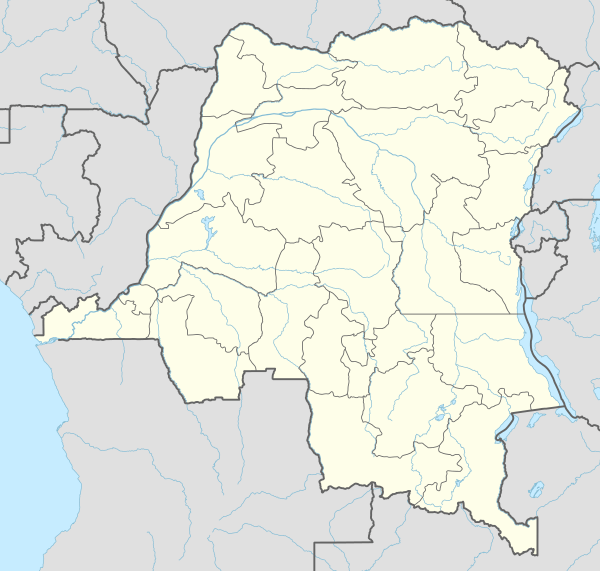 Kolwezi or Kolwesi is the capital city of Lualaba Province in the south of the Democratic Republic of the Congo, west of Likasi. It is home to an airport and a railway to Lubumbashi. The population is approximately 453,000. Kolwezi is an important mining centre for copper and cobalt. There are also uranium, radium, oxide ores, and lime deposits. The Musonoi mine is a set of open-cut pits near Kolwezi from which copper and other metals have been extracted since the 1940s. The nearby Lake Nzilo was created by damming the Lualaba River to provide a source of hydroelectric power and a reservoir of water for the mining activities. The city was created in 1937 to be the headquarters for the western mining group of the High Katanga Mining Association (UMHK). On Saturday,13 May 1978, ex – Katangese soldiers supported by Angola, occupied the city. 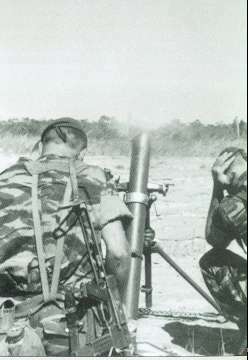 The government of Zaire asked Belgium, France, Morocco and the United States to restore order. The 2e REP, an elite paratroopers unit of the French Foreign Legion, were sent in to drive out the rebels and rescue any hostages. The Belgian army also deployed a force of some 750 Paracommando Regiment paratroopers and moved out just over 1,800 Europeans to other cities in the region. 700 Africans, including 250 rebels, 170 European hostages and 6 paratroopers died. Near Kolwezi there is the static inverter plant of the HVDC Inga-Shaba. 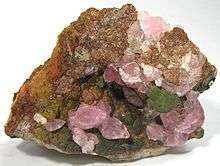 A specimen of Kolwezite (green), a rare copper-cobalt mineral named after Kolwezi, and pink cobaltoan calcite. The Kolwezi Airport serves Kolwezi and the surrounding area. 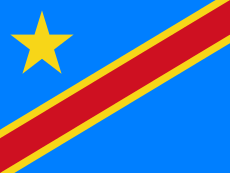 The airport is located about 6 km (4 mi) south of Kolwezi. ↑ "Musonoi Mine, Kolwezi, Katanga Copper Crescent, Katanga (Shaba), Democratic Republic of Congo (Zaïre)". Mindat.org. Retrieved 4 November 2011. ↑ Davies, Bryan Robert; Walker, Keith F. (1986). The Ecology of river systems. Springer. p. 203. ISBN 90-6193-540-7. ↑ KEITH E. BANISTER, ROLAND G. BAILEY (July 1979). "Fishes collected by the Zaire River Expedition, 1974–75" (PDF). Zoological Journal of the Linnean Society. 66: 205–249. doi:10.1111/j.1096-3642.1979.tb01909.x. Retrieved 4 December 2011. ↑ "Weatherbase: Historical Weather for Kolwezi, Democratic Republic of the Congo". Weatherbase. 2011. Retrieved on 24 November 2011. ↑ "Distance and heading from Kolwezi to airport". WikiMapia. Retrieved 18 February 2010. Wikimedia Commons has media related to Minerals of Kolwezi.